Corona is blessed with plentiful sunshine and beautiful year round weather which makes Corona ideal for producing green solar energy by installing solar panels on your roof or land encompassing your home. Because of our desert like heat, your energy needs are increased with everything from running your pool filter, air conditioning, and fans to beat the heat. Using more energy means an increase to your electricity bill each month and the simplest way to offset those expenses is a solar energy system designed for your unique needs. We offer various financing possibilities with several tax and utility incentives to help lock in your power prices for many years. Is Your Home in Corona Solar Power Compatible? A large percentage of homes and businesses in Corona have solar panels to generate green power easily, but why did they choose to go solar? We know choosing a solar energy contractor in Corona can be confusing, but we are here to help. We often receive questions like; How much does solar cost? Is the solar tax rebate still available? How many solar panels do I need? Who should I choose to install my solar? We will answer all of these questions and more during your free solar consultation. The power companies are continuing to raise electricity rates, and you will unquestionably be paying more to power your home every year. The only way to keep your power rate from continually raising is to install solar panels and flip the switch on an economical, efficient solar power system which will provide meaningful benefits for you and your wallet. Corona is a desirable location in Riverside County due to its proximity to the freeway for commuters who work in nearby cities. The real estate values continue to increase which makes solar panels a wonderful way to raise the value of your home or property. Can Solar Panels Add Value To Your Corona Home? Example: Installing a 5kW solar panel system can add on average $20,000* ($4 x 5,000W =) $20,000 to your homes property value. Roughly each watt of solar power adds about $4 to a home’s value in the state of California. *CA averages vary based on the size of your system, quality of solar equipment and you typically won’t see this additional value unless your panels are paid off. Your Future – Do you own your home? Are you planning to move? Location – Is your roof location ideal for solar? i.e. is it south facing? Roof Style – To maximize sun exposure, your roof panels need to meet particular conditions. Energy Habits – Is your energy bill over $100? Your Finances – Depending on how you decide to purchase and install your solar panels, there are many financial incentives to help reduce costs. Rest assured we will go over all of this and more to help you decide if solar is right for you. Why Should You Hire A Local Corona Solar Energy Contractor? CalState Solar has helped solar power customers in the city of Corona for many years. We work closely with the city and neighborhood HOAs to assure building permits, and your solar panel install goes smoothly. We are located just West of the I-15 freeway not too far from you, and several of our solar installers live in the immediate area. When you hire a local solar energy contractor, more of your money remains here in our area, and that continues to impact the city in significant ways. Whether you live North of the CA 91 freeway in Corona Hills or Corona Ranch, or maybe you live close to downtown and Main St. by the Corona Community Center or the North Main Corona Metrolink station or on the South end of Temescal Valley we have your solar needs covered. South Corona located south of Ontario Avenue to Sierra Del Oro to the West along Green River Rd to Dos Lagos near the southern city limits along Interstate 15 and Temescal Valley including the neighborhoods of Sycamore Creek, Trilogy, The Retreat, Horsethief Canyon Ranch to El Cerrito and Eagle Glen. We are a top sub-contractor for many of the predominant solar businesses in CA so you can trust us to not only help you determine a suitable system but build your solar installation trouble-free and on time. Every new customer starts out with a meeting with either one of our owners, or one of our highly trained consultants. During the meetings, we are much more interested in learning about your goals than to try and give you a standard solar system. Nothing is standard, and it is our goal to make this experience perfect for you. Solar Financing has come a long way in the last few years. Unless you choose to pay cash, all options are $0 Down and guaranteed to have lower monthly payments than the electric bill you are replacing. You can finance your solar system with a lower APR than you can find with a home or car loan. When we discuss your options, we will tailor them to the specific needs of your household and personal budget to maximize your savings. Once you decide to get solar, we will come back out to your house and complete a site audit. The first step is you qualifying us as a company and making sure we are who you trust to complete this job in the best manner possible for you. 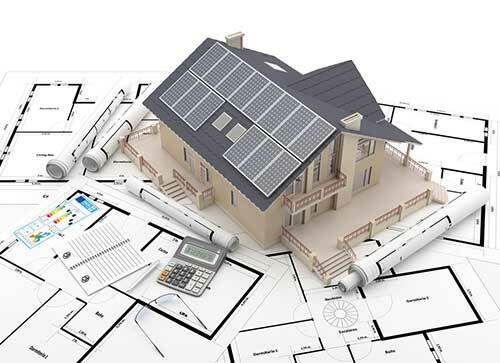 The site audit is CalState Solar making certain that we can qualify and build solar on your house. We look at the roof support, the roof type, the electrical system in your home, we look at the ground if need be and perform an assessment of the shape your house is in. If there are any issues with your house that need to be addressed and replaced, this is where we diagnose and then discuss with you the best option to get them fixed. Because we are a general contractor, in most cases we can fix them ourselves and for a much better price than you can get from anyone else. Once completed and we approve your house, we will send you an electronic design of the solar on your roof for you to approve. Once approved, that design will be sent to our Engineer, and we will get the plans prepared for your jurisdiction (city or county building and safety). We will work with the jurisdiction until the plans are approved, and the permit is ready to pick up. Each HOA is different, and they rarely work with companies on approvals, so in this case, it is your responsibility to work with you HOA and get the system approved. We will cooperate with you and give you everything they require from us to make sure we get the approval before we are ready to build. Once the permit is approved, we will contact you to schedule your installation date. Typically we try and schedule a week or so out, however, if things work out right and we can get you in sooner we will certainly do so. You will find our crew is highly trained and incredibly respectful. We will walk you through the whole job, show you how it works, and consult you for any considerations required. Once the installation is complete, we will contact the city and get their final approval. We will then take that approval and send it to the utility to get PTO (Permission to Operate) this is the final approval from the utility and when your system goes "live." Find out today if solar is right for you. We will go over all the details to calculate the cost, savings and incentives you are likely to get from installing solar panels for your home.